We are proud to announce CaptureLife is now available in ROES, Remote Suite Plus Print Products, Designer Plus and the Miller’s Loyalty Program. Experience is everything. 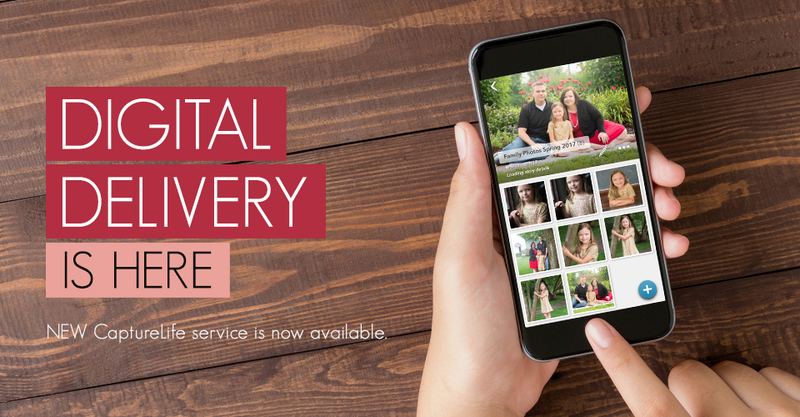 With CaptureLife, you can deliver digital photos straight to your client’s smartphone via text message and email. Today’s customer wants easier access to their images so they can be shared socially. This gives you an opportunity to offer digital delivery at a premium and increase your average orders. All you have to do is select the CaptureLife option in the shopping cart when you checkout. If you’re enrolled in the Miller’s Loyalty Program, you will earn 10% commission on every order your clients place through the Mpix Print Store in the CaptureLife app using images you digitally delivered. Am I to assume that any image that I would want to offer as digital delivery would need to be printed in order to be added to Capture Life? Am I also to assume that I would need to do each client order in a separate ROES order to be able to get individual apps for each customer? It would be infinitely easier if you added Capture Life as a specific product in ROES and allowed me to place images into it similar to an album which would then allow me to make several client orders in a single Millers ROES order. So…now I have to PAY .25 per image for you to host my clients’ images, and I only get a 10% commission if they order products from you??? Excited about this new opportunity. I think it will be a great asset. I know it hasn’t launched yet, but wondering how this will work for the Sports & Events / Schools program. Will I be able to deliver something to them to show them their log-in, etc or will the automation require it in the software and then automatically email them their products? Thanks for the suggestions, Amanda. If you would like to digitally deliver images that you don’t order as printed products, you are able to do that through the Miller’s Loyalty Program. However, if you are selecting digital delivery in ROES, you would need to do each client order as a separate order to deliver the images to each customer. Hi Bentley. Are you currently using another method of image delivery or hosting for your clients? Great to hear your excitement, Josh! The process will be automated through the software, so you will enter your clients information (name, phone number and/or email address) and the images will be automatically delivered to them. So are other photographers charging for the digital images when a customer buys prints? I know some of my clients are buying prints and then scanning the images so they can have them digitally just for social media. I’m almost leaning towards just “giving” them the digital through this program if they order prints as a way to pass along to others who may potentially buy more prints. I’d like to see how other studios are doing this. Hi Anne, we typically see that other photographers are charging for digital images in their packages.